This blog is a summary of an article that appeared in Competition Law Insight examining the key competition law principles in energy market mergers. The article can be found at: https://www.competitionlawinsight.com/competition-issues/energy-market-mergers–1.htm?origin=internalSearch. Since the mid-1990s, the European Commission has pursued a policy of energy market liberalization. At first, the Commission did so as legislator with the adoption of three successive liberalization directives. Since the beginning of the century, the Commission has supplemented its role as policy-maker by making full use of its competition policy enforcement powers. This has particularly manifested itself in its assessment of gas and electricity mergers under the EU Merger Regulation. The Commission’s push towards increasingly competitive energy markets by way of this two-track approach was approved by the Court of Justice of the European Union in a 2010 judgment. In its assessment of energy mergers, the Commission must first define the relevant product and geographical markets. Because energy mergers usually comprise both gas and electricity markets, this determination must be made for both markets separately. In terms of the relevant product market, the Commission distinguishes between upstream and downstream markets for electricity. The upstream electricity market comprises a single wholesale electricity market, which interestingly includes the financial trading of electricity, as well as the market for ancillary services and balancing power. In making these distinctions, the Commission bases itself mostly on the criteria of substitutability, including price elasticity. At the downstream level of the electricity market, the Commission has identified three levels of supply, i.e. supply through the transmission network, and two types of supply through the distribution network, one to small industrial and commercial users and the other to eligible household customers. The Commission’s assessment practice has demonstrated a steady preference for market share calculation on the basis of supplied volume, despite the fact that publicly available data released by regulators is mostly provided on the basis of physical connection points. To date, it firmly refuses to differentiate between sources of electricity such as wind, solar or nuclear. In future, this practice could come under increasing pressure for change given the increased impact of these power sources on consumer preferences. In defining the relevant product market for natural gas, the Commission has categorized five different supply markets—supply to dealers from the supply to electricity producers, supply to large industrial and commercial users, supply to small industrial and commercial users and supply to eligible household customers. Finally, markets having a physical trading hub, such as a dedicated LNG sea port terminal, also constitute a separate gas market segment. Despite this seemingly uniform approach in defining market segments, there exists a high degree of variation in the thresholds at which they have been categorized. For example, in France, the threshold between the categories for small and large industrial and commercial users was set at 5 Gigawatt hours, whereas the threshold between the same gas market segments was set at 12 Gigawatt hours for Belgium. The Commission breaks down gas market segments further between high-calorific and low-calorific gas (H- and L-gas) because of their non-substitutability. However, there have been recent cases where parties have not even disclosed such data because they were of the view that the market shares would not differ significantly, or would involve a minimum increment. At the geographic market level, energy market definition is subject to a case-by-case approach, with some markets being national and others sub-national or regional. These ad hoc determinations are made mostly by looking at customer switch rates, local marketing strategies and pricing policies. Finally, our article identifies five market factors that can be regarded as the most significant obstacles to further market liberalization. In particular, we have pointed to high concentration levels on energy markets, high levels of vertical integration, the remaining government regulatory influences on pricing as well as public ownership, differences in prices and the “incumbency effect”, referring to the structurally lower rate of customer switching, to the benefit of legacy suppliers. UK electricity interconnectors: all coming together (by about 2020)? One of the problems faced by the UK in achieving security of electricity supply at an affordable cost is its comparatively low level of interconnection with the electricity networks in other countries. But recent developments offer some prospect that the UK may become a bit less of a “power island”. The EU’s goal of a single electricity market has the potential to help national Governments with all three horns of the energy trilemma (how to maintain security and decarbonise whilst keeping energy prices at a reasonable level). But it cannot be realised without adequate interconnection capacity. As long ago as 2002, the European Council set EU Member States a target of having electricity interconnections equivalent to at least 10% of their installed production capacity by 2005. Twelve years on, the UK is only half way to meeting this target. In May 2014, as part of its work on European energy security, the European Commission proposed an interconnection target of 15% for 2030. This was adopted by the European Council in its 23 October 2014 conclusions on the EU’s 2030 Climate and Energy Policy Framework. Meanwhile, as Member States connect increasing amounts of intermittent renewable generating capacity to their networks, leaving them in some cases with total generating capacity that is much greater than the amount of power they can reliably generate at any given moment, the goal of achieving 10% or 15% of total installed generating capacity becomes more challenging (see the statistics and charts below). While such targets are undoubtedly useful, the optimum proportion of interconnection capacity is not the same for each Member State and is bound to change over time with the evolution of its generating mix and electricity consumption profile. However, it is not always easy for the market to respond quickly and produce more interconnection capacity where it is most needed given the amounts of capital and the regulatory processes involved. Achieving an interconnection target of 10% or 15% of installed generating capacity in the UK is particularly challenging. 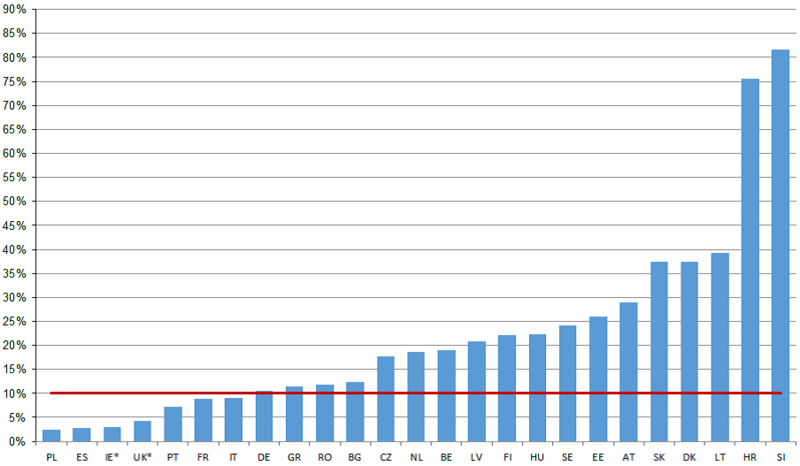 Even before it began to add significant amounts of renewable generation, the UK had one of the larger generation capacities in the EU, and it is very much more expensive per MW to create connections between the electricity networks of Great Britain and other EU Member States than it is to connect networks between Member States which share a land border. The costs per km of a subsea cable connection are several times greater than those of an overhead transmission line, and the distances involved in GB interconnectors tend to be larger than those which link the transmission systems of different countries in Continental Europe. However, if the costs of interconnection are significant, so too are the potential benefits for UK consumers. In a paper entitled Getting more connected published earlier this year, National Grid estimated that: “each 1GW of new interconnector capacity could reduce Britain’s wholesale power prices up to 1-2%…4-5GW of new links built to mainland Europe could unlock up to £1 billion of benefits to energy consumers per year“. As the European Commission’s most recent report on energy prices and costs in Europe notes, in some of the countries to which the GB system either is not yet connected or with which it could be much more interconnected, average baseload wholesale electricity prices are up to 40% lower than those in the UK. So is the potential for new UK interconnection capacity going to be exploited anytime soon? There are encouraging signs both from a regulatory point of view and in terms of actual projects. The regulatory treatment of projects is crucial to the development of more interconnection. In this respect, there have been a number of helpful recent developments for potential UK interconnectors. In August 2014 Ofgem confirmed its intention to implement, with only minor modifications, its previously consulted-on proposals for the regime that will apply to the regulation of near term GB interconnector projects (i.e. those expecting to be commissioned by the end of 2020 and likely to be taking significant investment decisions in 2015). Ofgem recognises that if the development of new UK interconnection capacity is left to proceed without any form of regulated “consumer underwriting”, it is likely that insufficient new capacity will be built. It therefore proposes a 25 year regulatory regime of a “cap and floor” on revenues, based on its assessment of the need case and efficient level of costs for projects. The new regime, building on Ofgem’s approach to the Project Nemo interconnector, aims to combine advantages of both the traditional regulated revenue model and more purely market-based approaches. Ofgem’s 27 October 2014 consultation on the Caithness Moray transmission project shows how far a regulator’s assessment of efficient costs for a project involving subsea cables can vary from a developer’s estimates. Also in August 2014 the UK Government published a paper entitled Contract for Difference for non-UK Renewable Electricity Projects. This raises the prospect of Contracts for Difference (CfDs) under the Energy Act 2013 being competed for by and awarded to renewable electricity generating projects outside the UK by 2018. This is a significant step, given the continuing importance of subsidies for the renewables sector (and coming as it did shortly after the approval by the Court of Justice of EU Member States’ historic tendency not to extend their national renewables support schemes to generators in other Member States – notwithstanding the potential for such restrictions to impede free movement in the single market for electricity). In September 2014, the Government included in a consultation on supplementary design proposals for the Capacity Market established by the Energy Act 2013 an outline of how interconnector owners could participate in future Capacity Market auctions. This had been promised in the context of obtaining state aid clearance, so as to ensure that the Capacity Market, like similar measures being put in place by other Member States, does not militate against the integration of national markets – clearly a matter of concern to the European Commission. Interconnection is most effective when the interconnector capacity is allocated most efficiently and facilitates the flow of electricity from areas of lower to areas of higher prices (see study on this). These outcomes should be brought closer by the progress there has been in integrating EU national electricity markets through the Target Model. In February 2014, the markets in GB and 14 other EU Member States became part of the day-ahead price coupling regime for North-West Europe (and in May 2014 they were joined by Spain and Portugal). In April 2014, a number of Central European Transmission System Operators, National Regulatory Authorities and Power Exchanges signed an MoU to develop flow-based market coupling, which in time will enable better calculation of the network capacities that are allocated through the price coupling process. Finally, the 2013 EU Regulation on cross-border infrastructure (“projects of common interest” or “PCIs”, which are to be fast-tracked through national consenting processes) should make it easier to get interconnection projects funded and built. In terms of actual projects, Ofgem’s October 2014 preliminary decision on eligibility of projects to benefit from the cap and floor regime identifies five projects that aim to commission by 2020 and, having come forward in the first cap and floor application window, have been judged sufficiently mature to proceed to the three to six month initial project assessment stage. The five projects are: FAB Link between GB and France; Greenlink, between GB and the Republic of Ireland; IFA2, between GB and France; NSN, between GB and Norway (recently granted a licence by the Norwegian Government); and Viking Link, between GB and Denmark. According to Ofgem, these projects, together with Project Nemo and the Channel Tunnel-based ElecLink, could add up to 7.5GW of interconnection – more than doubling existing GB cross-border apacity. They have a number of points in common. A number of these projects feature in the ENTSO-E Ten Year Network Development Plan and the European Commission’s list of PCIs. Most of them involve the Transmission System Operators of one or both of the countries they would run between or companies affiliated to them. Establishing links between GB consumers and renewable generation outside GB is an important part of the rationale for many of them (the FAB Link project even involves plans for up to 300MW of electricity generated from the tides around Alderney). Recent publicity for the TuNur project to export large amounts of solar-generated electricity from North Africa to Europe, including the UK, shows the scale of the possibilities in this area. It now remains to be seen whether the further development of the Government’s proposals on non-UK renewable and interconnected capacity – and perhaps more significantly the outcomes of the first CfD and Capacity Market auctions (which will not be open to interconnected / non-UK capacity) – will enhance or detract from the business case for these projects. State aid for Hinkley Point C (3): What hope for “no aid” arguments? 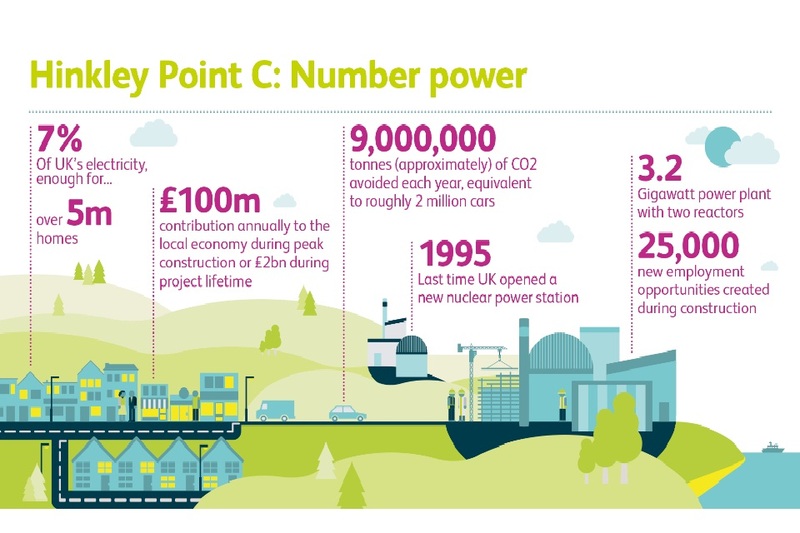 This post is the third in a series on the European Commission’s initial assessment of the package of measures by which the UK Government proposes to provide financial support for the proposed new nuclear generating station at Hinkley Point (HPC) by NNB Generation Company Limited (NNBG). In this post we focus on the Commission’s analysis of the UK Government’s arguments that its support for HPC does not constitute state aid within the meaning of Article 107(1) of the Treaty on the Functioning of the European Union and that HPC would be performing a service of general economic interest (SGEI), effectively meaning that it fell outside the state aid rules (for a summary of the overall framework of the Commission’s appraisal, click here). As noted in the previous post, any “no aid” decision, or categorisation of the HPC as an SGEI, effectively turns on the application of the so-called Altmark criteria. The quality of the Commission’s arguments in this strategically important area is variable. The Commission begins by making the point that it sees a service of general economic interest (SGEI), such as the Government claims would be provided by NNBG, as a service which an undertaking would not supply if it were considering its own commercial interest, and which serves a general economic interest. In the context of HPC, the Commission’s starting point is that NNBG’s service would be to supply (baseload) electricity; yet that, the Commission says, is “normally considered a commercial activity and a market in which competition takes place”. It suggests that nuclear generation is no exception to this principle, noting the “nuclear plants which are operated commercially” in the UK by NNBG’s parent EDF, and the “UK’s own assessment” that “private investors [would]…invest in nuclear energy in the UK by 2030 at the latest. Finally, if the service which would not be provided without aid is the construction of HPC by an earlier date than the private sector would otherwise build new nuclear capacity, the Commission suggests that the UK has not made a convincing case for such early construction being in the general economic interest on security of supply or decarbonisation grounds. Almost every assertion that the Commission makes in the two pages or so which it takes to reach these provisional conclusions on “the existence of a SGEI” is questionable in terms of its accuracy or its relevance. Electricity generation is indeed a commercial activity. That does not mean that the construction of a new nuclear reactor is a service that will be provided without state aid. Nor does the existence of the UK’s legacy nuclear fleet help the Commission’s case, constructed as it was by the CEGB in the days of nationalisation. The Commission’s dismissal of security of supply and decarbonisation as interests served by the putative service of constructing and operating HPC is similarly one-sided. For example, it effectively denies that there is any benefit in securing decarbonisation sooner if you think the market will decarbonise a few years later, and it ignores the effects on both security of supply and decarbonisation in both the longer and the shorter term which assurance about the viability of HPC (in the form of state aid clearance) could have. The first Altmark criterion (which is also key to any attempt to justify a measure under Article 106(2)) is that the beneficiary be entrusted with a public service obligation (PSO). The Commission argues that provisions of the CfD which limit the return which NNBG can make on its investment in HPC or penalise it for late delivery of the project are not capable of being PSOs. The best claim that the CfD has to being regarded as placing NNBG under an obligation is that if it does not build HPC (or delivers it late), it will receive no money (or less money) under the CfD. The Commission appears to be suggesting that in order to be a PSO, an obligation (e.g. to commission HPC by a certain date) has to be “enforceable” by some means other than the payment or non-payment of aid. If the Commission is right about this, it may have implications for the design of the CfD contract terms more generally. However, the Commission only engages very briefly with the case of Fred Olsen, which appears to offer some support to the UK Government’s view. In that case, which concerned ferry services, the Court of First Instance remarked that the fact that an operator “unilaterally abandoned or altered the conditions for the operation of some maritime routes indicates at most” that it “failed to honour some of the obligations imposed on it by the provisional arrangements”, and seems to have found that not even the fact that an operator was subsidised at its own request prevented it from satisfying the first criterion. Looking beyond the particular circumstances of HPC, what the Commission seems to be saying here could have implications for the financing of other CfD-subsidised schemes. If the Altmark criteria do truly require the state to have the means of enforcing compliance with requirements, such as the construction of HPC, that go beyond the stimulus provided by the absence of CfD revenues if no electricity is generated, it may not be possible to construct bankable CfDs which satisfy those criteria. Elsewhere, in the analysis of Article 106(2) arguments, the Commission suggests that the absence of a true PSO is what excuses the UK from having to comply with the public procurement rules in respect of letting a CfD in respect of HPC, and that, conversely, if the requirements imposed on NNBG could be shown to constitute a PSO, the UK Government would have failed in its alleged obligation to follow the public procurement rules. The Commission broadly accepts that the second Altmark criterion is satisfied – i.e. that the parameters on the basis of which the compensation is calculated are established in advance in an objective and transparent manner. However, when it comes to the third criterion, that the compensation cannot exceed what is necessary to cover the costs incurred in the discharge of the PSO, its assessment is much less favourable. Moreover, some of the arguments which emerge here also read across into the Article 106(2) and Article 107(3) analysis. The Commission is concerned, firstly, that the Government does not appear to have a firm view of what the costs of discharging the PSO are (making the level of compensation by definition hard to assess); secondly, that the level of profit that NNBG can expect to earn over the lifetime of the CfD was negotiated with NNBG rather than being “established by reference to the rate of return on capital that would be required by a typical undertaking considering whether or not to provide the alleged SGEI”; and thirdly, that because the 35 year lifetime of the CfD is shorter than the 60 year lifetime of HPC, NNBG could earn super-normal profits in years 36 to 60. It is hard to comment on the first two of these points as far as HPC is concerned without access to the UK’s submissions to the Commission, although in response to the second one might ask: what is a “typical undertaking” considering whether or not to build HPC, let alone (as the Commission goes on to elaborate) “the average cost structure of efficient and comparable undertakings in the sector under consideration” – none of which have been built under exactly the same regulatory regimes as HPC would be built and operate under? Moreover, for much of the period during which the Government was negotiating with NNBG, it was simply the only undertaking willing to contemplate any form of investment in new nuclear build in the UK. On the other hand, prospective recipients of aid under enduring CfD regime for renewables in mind regime may take some comfort in this context from the fact that their strike prices will not be the result of bilateral negotiations. But the Commission’s point about the duration of the comparative lifetimes of the CfD and the generating station is something on which we can comment in the HPC context. The strike price, we are told, has been set at a level which is designed to ensure that NNBG covers the costs of construction and operation and makes a return of 9.87% on the project as a whole over its lifetime (in post-tax, nominal terms). Yet, as the Commission points out, once the CfD expires, the profitability of the plant is uncertain because the level of revenue accruing to the operator from the sale of electricity is no longer controlled by the strike price mechanism. This makes it harder for the Commission to rule out the possibility of overcompensation during the post-CfD period of the plant’s operation. The Commission suggests two ways of dealing with this problem: making the CfD coterminous with the life of the plant, or providing some means for the state to recover any overcompensation within the CfD itself (effectively a gain-share provision for the period when the strike price mechanism no longer applies). One problem with the first of these, if taken in isolation, is that it is not possible to predict the lifetime of a plant with certainty when the strike price is initially calculated. In principle, it would seem that this arguments is not unique to the case of HPC and could be applied to the wider CfD regime. The differences are that the periods of time involved – both CfD durations and plant lifetimes – are shorter for non-nuclear projects, so that the calculations are less dependent on very long range predictions of electricity prices; and that there is more comparative data on which to assess technology costs. Whether the Commission will consider these differences to be sufficient for it to take a more favourable view of this aspect of the wider CfD regime than it has so far in the case of the HPC package remains to be seen. In this context it is curious that the Commission states that “nuclear production, which requires very high levels of capital for the investment in the construction and hence before revenues can be generated, while also being characterised by a relatively low level of operating costs once the plant has been built, has few, if any, equivalents in commercial activities”: the CfD regime as a whole is surely predicated on the assumption that all the technologies it covers (renewable, nuclear, CCS) have in this sense a similar cost profile. The fourth Altmark criterion is that where the undertaking which is to discharge a PSO is not chosen through a public procurement process, the level of compensation must be determined on the basis of an analysis of the costs which a typical, well run, undertaking would have incurred. Here again, the problem is in finding the appropriate comparator. Unsurprisingly, the Government has commissioned a review of NNBG’s cost estimates to determine whether they are “reasonable”. The Commission says that this is not what the Altmark criterion requires. The final sections of the Commission’s analysis of the UK’s “no aid” arguments deal with the credit guarantee and the proposal to compensate NNBG in the event of a “political shutdown” of HPC. On the credit guarantee, the Commission essentially reserves judgment owing to the lack of detail available. However, it does lay down a marker when it observes that the guarantee “seems to differ from ordinary debt guarantees in that it would be drawn before equity, apart from equity already spent…It would therefore appear that [it] might diminish the risks borne by equity holders”. The Commission appears prepared at this stage to accept the UK’s argument that political shutdown proposals do not constitute state aid, subject to the provision of more information “on whether this compensation…would also be available to other market operators placed in a similar situation”. This is intriguing. It is presumably possible that the UK Government would be prepared to offer a similar deal on political shutdown to another nuclear operator, but such a deal is clearly not on the table for operators of renewable technologies, for example, and whilst a political shutdown of UK wind farms may be a more remote possibility than something like the German reaction to Fukushima, will that point be sufficient to satisfy the Commission that the enduring regime for renewables should not in this respect be “levelled up”, to confer on its beneficiaries the additional protection offered to NNBG? It is clear that the Commission is highly reluctant to reach a finding that there is “no aid” in the HPC package, or to find that there is an SGEI within the meaning of Article 106(2). It does not want to treat nuclear power as a special case. Yet unless it is prepared to recognise that nuclear power is not just another source of baseload electricity, how could the Commission find that there is no aid (or that there is a SGEI) in a CfD negotiated directly between a Government and the beneficiary undertaking which includes a generous strike price, a 35 year term and investor protection in the event of political shutdown – and still realise its ambition of cutting back on subsidies for renewables? To go by the evidence of the Commission’s initial assessment, the Government would – rightly or wrongly – have to do a lot more work both in terms of scheme design (including changing some features of the currently proposed CfD arrangements) and in terms of arguing its corner with the Commission if it is to persuade the Commission that there is “no aid” to NNBG. It is possible that the Court of Justice might be more sympathetic to the Government on some of these points, but EU litigation would not help the timeliness of the delivery of EMR objectives. This is the second in a series of posts on the European Commission’s initial assessment of the package of measures by which the UK Government proposes to provide financial support for the proposed new nuclear generating station at Hinkley Point (HPC): click here for the first in the series. The text of Commission’s letter is now also available in the Official Journal of the European Union: interested parties have one month from the date of its publication (7 March 2014) to comment. In this post we summarise the Commission’s analysis of the HPC support package. This consists chiefly of a proposed Contract for Difference (CfD) and a credit guarantee conferred by participation in HM Treasury’s UK Guarantees Scheme: both are conveniently summarised in the opening paragraphs of the Official Journal notice. Secondary legislation has established an administrative framework for dealing with state aid cases (for further detail, click here). Measures that are put into effect without having been notified and approved under Article 108(3) are “unlawful aid”. If the Commission finds unlawful aid is incompatible with the internal market, it may require Member States to recover it from the beneficiaries. To gain the Commission’s approval for the HPC package, the UK Government must therefore persuade the Commission either that its support for HPC does not constitute state aid within the meaning of Article 107(1), or that such support is compatible with the internal market. The Government has identified three possible ways to avoid a finding of incompatibility, as set out below. Any claim that a measure does not constitute state aid depends on showing that one of the elements of aid set out in Article 107(1) – state origin of the aid, conferral of a “selective advantage”, impacts on intra-EU trade and competition – is not present. We take each of these in turn below as they have been applied to the HPC support package. Apparently, the UK authorities “do not contest” that the CfD is financed from resources under the control of the state. The Commission points out that the CfD will be administered by a Counterparty body essentially controlled, and potentially underwritten, by the Secretary of State. As regards distortion of competition and an effect on intra-EU trade, the Commission observes: “As in this case the notified measures will enable the development of a large level of capacity which might otherwise have been the object of private investment by other market operators using alternative technologies from either the UK or other Member States, the notified measures can affect trade between Member States and distort competition.”. That leaves as the key battleground the question of whether the support package confers a “selective advantage” on HPC. Would HPC be getting a deal that will give it an advantage in the market and that is not open to its competitors? In order to show that this element of the definition of aid is made out, the Commission has to engage with the criteria laid down by the Court of Justice in the case of Altmark. In that case, the Court found that in certain circumstances compensation provided to undertakings entrusted with a public service function would not constitute state aid. The Commission considers the Altmark criteria (discussed in the Commission’s 2012 Communication on compensation for the provision of services of general economic interest (SGEI)) in some detail. Overall, the Commission finds it hard to see that HPC would be entrusted with the kind of public service obligation (PSO) that the Altmark criteria envisage. It also inclines to the view that the compensation which HPC stands to receive under the CfD would be more than the Altmark criteria permit. The Government argues that if the HPC package is considered to be state aid, its contribution to the common EU objectives of decarbonisation, security of supply and diversity of electricity generation, and addressing related market failures, outweighs its negative impact on the internal market. The Commission is not persuaded by these arguments in favour of a finding of compatibility under Article 107(3). For example, it is sceptical of claims about decarbonisation on the basis that support for HPC could crowd out investment in other low carbon technologies; and it queries claims about security of supply on the grounds that the most immediate concerns about the adequacy of the UK’s electricity generation capacity relate to the current decade, not the 2020s when HPC would be commissioned. But the Commission’s scepticism about the objectives of the HPC support package is only the beginning of its concerns from an Article 107(3) point of view. Even if it were prepared to accept that the HPC package is aligned with one of the “common EU objectives”, the Commission queries whether state aid – in the combined form of the proposed CfD and credit guarantee – is needed to enable HPC to achieve these objectives. Overall, the Commission suspects that the level of protection from ordinary market risks which the support package provides is excessive: more or less every aspect of the package, from the duration of the CfD to the way in which it has been negotiated, is viewed in sceptical terms, so that the Commission concludes by saying that it doubts “whether it effectively addresses a market failure”; questions “whether [it] can be deemed…to be proportionate”; and is “concerned about its distortive effects on competition”. A “service of general economic interest”? Article 106(2) is in some ways the ultimate derogation provision. It says, in effect, that certain undertakings will be exempt from the requirements of EU competition and state aid law if the application of that law would “obstruct the performance” of a service of general economic interest entrusted to a particular undertaking. The meaning of Article 106(2) has therefore been the subject of many arguments between the Commission and Member States. The Commission’s analysis in response to the UK’s SGEI arguments overlaps to a large extent with what it says in relation to the Altmark criteria and/or the Government’s Article 107(3) arguments. It concludes that the Commission doubts whether the HPC package qualifies as an SGEI within the meaning of Article 106(2) and the Framework, and that even if it did so qualify the Commission doubts that it would comply with the Framework. In future posts we will examine some of the Commission’s arguments in more detail. For now, it is worth noting some more general features of the Commission’s appraisal. There is a degree of unevenness about the Commission’s analysis. It makes some extremely good points and some decidedly weak ones. There are a number of points when the Commission appears to help the UK by indicating possible ways of correcting what it sees as deficiencies in the HPC package in state aid terms. Whether these potential “escape routes” are in practice open to the UK Government is another matter. The Commission – intentionally or otherwise – draws attention to a number of places where the HPC package is different from the rest of the CfD regime (or at least the enduring regime for renewables). Sometimes this is to the latter’s advantage, but not always. In an ideal world, the whole of the CfD regime would have been worked out in full before being notified together, but it so happens that the first part of the regime that the Commission examines in detail is not entirely typical or representative of the regime as a whole. Inevitably, much of the analysis is somewhat tentative, because details of almost all parts of the package still remain to be fully worked out. Behind everything lurks the question: how much (or how little) freedom do the EU state aid rules allow Member States to have as regards ensuring that a certain proportion of their electricity generating capacity belongs to a specified technology type? On 18 December 2013, the European Commission announced that it was opening an in-depth state aid investigation into the Government’s package of financial support for the proposed Hinkley Point C (HPC) new nuclear generating station. On 31 January 2014 the Commission published a version of the letter setting out its reasons for launching a detailed investigation and the points on which it requires to be persuaded of before giving state aid clearance to the package. What does the letter tell us? It is a fairly closely-argued 67 pages, so it will take more than one post to cover it. Today, we begin by setting the scene. The critical tone of parts of the Commission’s analysis has been noted in a number of reports, but this is perhaps not the most surprising feature of the letter if one considers its context. The package of support for HPC inevitably treats new nuclear as to some extent a “special case”. State aid policy is administered on the principle that free markets are best and that claims that a particular industry is somehow “special” are to be treated with scepticism – even if that industry is one in which there is already massive state intervention in various forms. The European Commission’s decision-making on state aid cases has sometimes been criticised for being too politically expedient. Here we have a case where the UK Government has invested huge political capital and the aid is going to a subsidiary of a company 84% owned by the French state. Even if the Commission is ultimately minded to approve the HPC support package it cannot afford to be seen to have given it anything less than an economically rigorous evaluation. In 2007, the Commission ruled on alleged state aid for the Olkiluoto 3 nuclear plant, to be built in Finland with French technology. The issue was whether a guarantee given by the French state gave Areva an unfair competitive advantage over other potential suppliers. The guarantee was found to have been given on market terms, so that there was no aid under the state aid rules. However, the proceedings still lasted three years and the Commission went through an in-depth investigation before reaching a final decision. In 2006, the Commission approved the arrangements for setting up the Nuclear Decommissioning Authority (NDA). Although the Commission acknowledged that the purposes behind the creation of the NDA were fully in line with the objectives of the Euratom Treaty, it was also very concerned about potential distortions of competition arising from it. For example, notably tight controls were set on the pricing of electricity sold by the UK’s Magnox nuclear plants, to be run by the NDA, for the few remaining years of their life. Most recently, the Commission decided that aid granted by Slovakia in relation to nuclear decommissioning was compatible with the state aid rules. In doing so, the Commission emphasised that the aid related to plants that had already been shut down; that it did not subsidize current electricity production; and that it was “strictly limited to what is necessary to cover the costs of decommissioning historic nuclear facilities, for which no adequate provisions were created in the times of a centrally-planned economy”. Moreover, the Slovak scheme was unlike “the numerous schemes of compensation for stranded costs, public service obligations and support schemes for renewable electricity, where the Commission has found that the financing of the support scheme through a levy has a protective effect of national electricity production”. The HPC support package is the kind of arrangement that is intrinsically harder for the Commission to get itself comfortable with than the Okiluoto or NDA measures. It explicitly and intentionally provides, under the Contract for Difference (CfD) mechanism, a guaranteed level of price for electricity and therefore a degree of revenue security which the market would not provide. It can therefore be characterised as “operating aid” (as opposed to “investment aid”), which the state aid regime regards as particularly problematic – since it shields operating businesses from normal market risks. Although there is an entire EU Treaty devoted to the promotion of nuclear power, it is politically controversial within the EU, and there are those who will take any opportunity to put the case, whether in administrative or judicial proceedings, against the adoption or approval of any measure that brings a “nuclear renaissance” in the EU closer. There are undoubtedly some features of the support package for HPC which, at least at first sight and taken in isolation, appear very generous. The Commission is in the process of “modernising” the state aid framework and has just published draft Guidelines on environmental and energy aid. The Guidelines do not cover nuclear projects, but take a notably tough line on e.g. support for renewables, even though the deployment of renewables is mandated by EU law in a way that nuclear power is not. Anything other than a searching approach to scrutiny of the HPC package would be out of keeping with the general thrust of current Commission policy in this area. Whatever the ultimate outcome of the Commission’s evaluation of the HPC support package, the final decision can only be robust against potential challenge if it has clearly stated the potential objections to what the UK Government is proposing. The UK public may have been encouraged to think that the hard part of HPC was over once development consent, a nuclear site licence, marine licence and other environmental permits were granted, and agreement on the strike price had been reached. But obtaining state aid clearance in this case was always going to be a challenge. And for all sorts of reasons, it is not surprising if at this stage the Commission has stated the “case for the prosecution” in clear and strongly worded terms. In future posts, we will examine some of the Commission’s arguments a little more closely, consider the possible outcomes of the Commission’s investigation into the HPC support package, and look at what the Commission’s letter indicates about the prospects for state aid clearance of the rest of the Electricity Market Reform (EMR) package. In a previous post we looked at how the UK’s existing fleet of coal-fired plant had been saved from being made subject to the “emissions performance standard” or EPS under the Energy Act 2013 provisions for Electricity Market Reform (EMR). This happened when the Government reversed an amendment that would have applied the EPS to existing coal-fired plant if its operators were to choose to keep it running in the long term by fitting the equipment necessary for it to comply with the new limits on emissions (in particular of NOx) that will apply to it from 2016 under the Industrial Emissions Directive (IED). In this post, we explore the choice which operators have to make under the IED – and why the Government may have thought it worth keeping them out of the EPS. Existing plant faces a choice under IED. In broad terms, it must either upgrade to meet the new emission limits, or run for a limited number of hours – for example, by opting for the “limited life derogation” (LLD). The LLD allows plant to run in its current form for 17,500 hours before closing no later than 2023. Subjecting existing coal-fired plant to the EPS if and when it upgraded to comply with IED NOx limits would have made it likely that its operators would opt for the LLD rather than upgrading, and at the load factors at which UK coal plant has been operating recently, most plants would probably burn through their 17,500 hours by 2020, if not before. Why should that worry us? Wouldn’t it just be another example of EU legislation that isn’t about climate change being more effective at tackling CO2 emissions than the EU Emissions Trading System? (Most UK coal plant closures to date have been driven by the Large Combustion Plants Directive, which the IED replaces, and which was designed to combat effects such as acid rain rather than “global warming”.) To understand why the Government was so keen to keep existing coal plant out of the EPS, we have to look at the work it is doing in the generating mix. In 2012, the UK’s total combined cycle gas turbine (CCGT) capacity (35.57GW) exceeded its total coal and oil-fired “conventional steam” generating capacity (30.97GW) for the first time. But that same year, gas’s share of electricity generation fell from 40% (in 2011) to 28% and coal’s rose from 30% to 39%. (Greenhouse gas emissions from the UK energy supply sector increased by almost 6 per cent as a result.) Coal’s high share of UK generation persisted, and appears to have increased slightly, in 2013. Why is this? Coal-fired power over this period has simply been cheaper than gas-fired power (partly because the availability of shale gas has hit US coal prices). It can keep the lights on at lower cost. Much of our coal-fired electricity comes from just 10 coal-fired plants, with a combined capacity of over 18 GW – about a fifth of generating capacity connected to the grid. Now that the 1 January 2014 deadline for indicating their operators’ intentions as regards the LLD has passed, and with the threat of EPS removed, we might expect that there would be some clarity as regards their future, but in fact there is still a degree of uncertainty about most of them. The future plans of three (Drax, Eggborough and Rugeley, together representing some 6.8GW of capacity, and all owned by generators who are not in the “Big 6”) appear to depend in part on plans to convert to burning biomass. The success of these plans is likely to depend on whether they are allocated EMR Contracts for Difference (CfDs), and meet the conditions for those CfDs to take effect (more on all this in a later post). One (E.ON’s Ratcliffe, 2GW) appears fully prepared for IED compliance. Another (SSE’s Fiddler’s Ferry, just under 2GW) has development consent to fit the necessary equipment. A third (Scottish Power’s Longannet, 2.3GW) is testing new technology to comply with IED. The operators of four of them (Aberthaw, Cottam, Ferrybridge and West Burton, representing together some 7.5GW) have provisionally decided not to invest in the equipment necessary to comply with the IED. Instead, EDF, RWE and SSE have said they plan to use the LLD. The story is clearly not over. EDF, RWE and SSE have all indicated that they may still choose to upgrade some of their plants to IED standards. So their choice of the LLD may be more about keeping their options open than representing their preferred long-term option for these four plants. RWE commented: “Only after we have political clarity on how the energy market will operate under the Government’s new energy legislation as well as any other political changes to be enacted, will we be able to make [a] final decision with confidence.”. The reference to the uncertainties still surrounding a number of aspects of EMR reminds us that some existing plant may be looking to the EMR capacity market as a means of funding investment in IED compliance. More on how the capacity market may work for coal and other types of plant in further posts. For the moment, though, note two more points. First, if operators wish to revisit their decision to choose the LLD and opt back in to the IED, they will be relying on, and will need to fit in with, the UK’s Transitional National Plan (TNP). The TNP permits plants to ease in to IED compliance by 2020 rather than 2016. But the UK’s TNP has so far not been approved by the European Commission as required by the IED. Second, according to Defra, RWE, EDF and SSE do not have to reach a final decision on IED until the end of 2015. This may be a very convenient deadline, since it comes after the next election, when operators will know whether Labour’s ambitious “Green Paper” proposals for further market reform are likely to be enacted. So, we are a long way from having heard the last of the power-politics of coal – although there are a few more legal elements to the debate than there were in the good/bad old days of the 1960s and 1970s. There is no doubt that coal still counts, but it looks as if we will have to wait a little longer to see how far we can still count on some of our existing coal-fired plant. 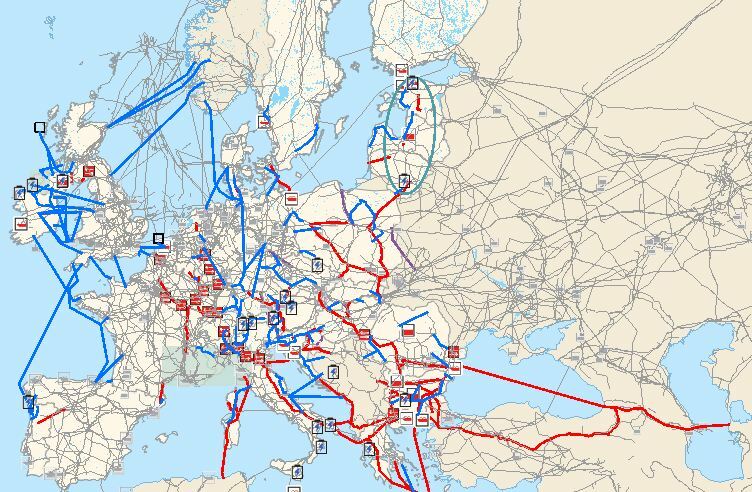 Plugging in to a European Supergrid? Interconnection is a hot topic. “We need much better grid interconnectors around Europe to enable energy to flow across the EU”, UK Secretary of State for Energy and Climate Change, Ed Davey, recently told The Independent. Mr Davey’s Department of Energy and Climate Change (DECC) has just published More interconnection: improving energy security and lowering bills. And it was recently reported that the development of a proposed UK-Norway interconnector was at a critical stage. 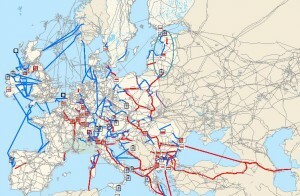 Interconnectors are essential to the EU single market in energy, which is meant to be completed in 2014. They are also likely to be part of the solution to the problem of how to include non-UK providers in capacity market auctions under UK Electricity Market Reform (EMR). This in turn may be an important point for the European Commission in granting state aid approval for EMR (see EU renewable generators: time to wean them off “overcompensating” subsidies?). But while last year’s EU Regulation on cross-border infrastructure should make it easier to get interconnectors built and funded, the new DECC paper, and the Redpoint analysis that accompanies it, show very clearly why interconnection is such a difficult area for the UK. Geography plays a part: it is inevitably more expensive to interconnect the UK with other EU markets than it is to interconnect many markets in Continental Europe. But that is only the start. Which markets should we connect to, and when? How big should the connections be? Who should build, own and pay them, where and when? The answers to these questions depend on a lot of other, interdependent factors that are themselves not easy to pin down: notably the future generating mix in the UK and other markets concerned, and future fossil fuel and carbon prices. DECC’s summary of Redpoint’s work notes that the possible impact on GB consumers ranges, rather neatly, from potential net benefits of around £9 billion to potential net costs of around £9.5 billion. Perhaps the toughest questions are who should decide between the competing merits of rival interconnection schemes, and when that decision should be taken. Historically, neither the planning regime nor the regulatory network development process have had to pick winners and losers in this way. But DECC’s acknowledgement that the issue should be looked at strategically and some kind of plan formed is encouraging. They identify Ofgem’s Integrated Transmission Planning and Regulation (ITPR) project, and its ongoing consideration of Project Nemo and other proposed interconnection schemes as the proper vehicle for next steps on UK interconnection policy: watch this space. 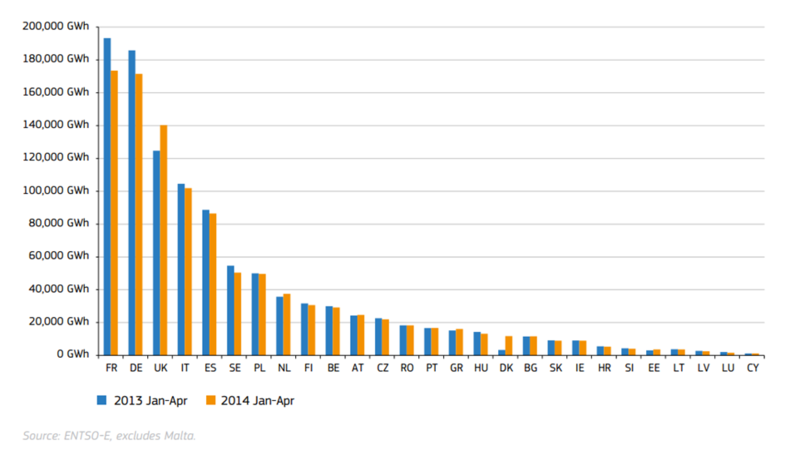 EU renewable generators: time to wean them off “overcompensating” subsidies? The European Commission has published draft state aid guidelines on environmental and energy aid for 2014-2020 for consultation. According to the accompanying press release, these would “facilitate the decarbonisation of energy supply and the integration of the EU internal energy market”. A less charitable reader might detect in the draft guidelines some tensions between the EU’s competing goals of promoting free competition and completing the EU internal energy market on the one hand and the need to reduce greenhouse gas emissions and ensure security of energy supply on the other. The draft guidelines follow the policy outlined in the Commission Communication on delivering the internal electricity market and making the most of public intervention, published with accompanying staff working papers in November: the suspicion that, notwithstanding “the challenges of the climate change agenda”, some national subsidy regimes for renewables are “overcompensating” what are now “mature” technologies; that new schemes designed to ensure security of supply may end up supporting plants that are unnecessary or inefficient; and that Member States too readily opt for subsidies rather than pursuing demand reduction options or the potential for EU market integration. There is considerable emphasis on the use of competitive bidding processes. The draft thresholds for determining whether a technology is “deployed” and subsidies to it therefore require to be subject to more rigorous criteria may be set quite low (between 1 and 3 per cent of production at EU level). For each technology / kind of aid, the draft guidelines list specific anti-competitive pitfalls to be avoided and/or ways to monitor for, and correct, possible overcompensation. And it is envisaged that the guidelines will apply not just to new schemes, but also to existing ones which are amended after the guidelines come into force – unless the only amendment is the publication of a new tariff, or the beneficiary has received confirmation that it will benefit for a predetermined period. In some ways, none of this should be surprising. By definition, even aid that has been cleared by the Commission remains susceptible to further examination in the light of changing market conditions – which may lead to something that was originally found compatible with the internal market subsequently being found to be incompatible. It remains to be seen whether the draft Guidelines will lead to this happening more often, or whether they will change much as a result of this new consultation (the third on this subject). One thing that is certain is that there is no shortage of high-profile cases to which the Commission can apply its current thinking. On the same day as the draft guidelines were published the Commission announced an in-depth investigation into a German scheme reducing renewables surcharges to energy-intensive users and into the UK’s proposed aid to EDF’s Hinkley Point C nuclear power station. All of which comes as a reminder that the low carbon investment support and security of supply elements of the UK Government’s flagship programme of Electricity Market Reform (EMR) require – and have yet to be granted – state aid clearance from the Commission. The same is true of the proposed exemption for energy intensive industrial users from the increases in supply charges that will fund EMR. It is not surprising that recent DECC announcements have stressed the possibility of e.g. moving to competitive bidding for EMR contracts for difference (rather than setting the “strike price” administratively) sooner rather than later. Fortunately, the EMR regime has been designed in such a way as to accommodate a lot of adjustments both before and after it goes live later this year.